The new movie Chocolat is causing quite a stir (pardon the pun), unfortunately it has not hit the New Zealand shores as yet so I am one of the few in the world it would seem yet to see it. Personally I cannot understand why its taking so long to make a movie about the subject, about the delights of this food of the Gods . . . unless of course you count Willy Wonka!? Because of this movie, my website and email has been running hot with people looking for the recipe that I will share with you this week, my chocolate webpages are currently being hit at a rate of approximately 800 per day. The recipe they are all looking for is one for the original chocolate drink as made and drunk by the Ancient Mayans and Aztecs. It was the Maya Indians, an ancient people whose descendants still live in Central America, who first discovered the delights of cocoa as long ago as 600 AD. The Yucatan Peninsula, a tropical area in what is now Southern Mexico, where wild cocoa trees grew, was where the Maya lived. They harvested cocoa beans from the rain forest trees, then cleared areas of lowland forest to grow their own cocoa trees in the first known cocoa plantations. 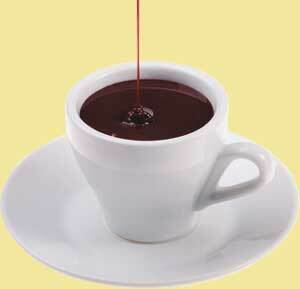 They made a drink called 'chocolatl' or xocoatl, it was made from roasted cocoa beans, water and a little spice, so valued were the cocoa beans they were also used as a currency. One god Quetzalcoatl, creator god and provide of agriculture, was particularly associated with cocoa beans. Great temples were built to honour him in Tenochtitlan; Moctezuma, Emperor of Mexico and ruler of the Aztecs in the early 16th century particularly revered him. Quetzalcoatl is further linked with the story of cocoa and chocolate. An old Mexican Indian myth explains that Quetzalcoatl was forced to leave the country by a chief god, but he was lovingly remembered by his devoted worshippers who hoped that he would return. Until that time they still had his legacy - the cocoa tree. When Don Hernan Cortes, the Spanish conquistador arrived in 1517 with his fleet of galleons, the Aztecs thought that he was Quetzalcoatl returning. 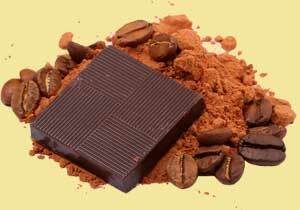 The word "chocolate" is said to derive from the Mayan "xocoatl"; and cocoa from the Aztec "cacahuatl." The Mexican Indian word "chocolate" comes from a combination of the terms choco ("foam") and atl ("water"); early chocolate was only consumed in beverage form. For more chocolate recipes and information on its history, cooking properties etc, visit my website: Tallyrands Culinary Fare, where there are pages and pages on the subject at www.tallyrand.info and look for the link on the left hand side of the page. I am still desperately trying to find suppliers for cocoa beans: wholesale or retail, so if anyone knows of any, anywhere in the world I would love to hear from you? Here then is that recipe with the alternative of making either the Mayan "Xocoatl" or the Aztec "Cacahuatl"
There are now two alternatives. With oil, which gives you a richer, yet bitter flavour or without oil a milder form will result. Put the paste inside a fine cloth, close the cloth up and squeeze until the oil comes out (similar to making fresh curds and whey): the more that is squeezed out the better. The Mayans were said to have added local herbs also; but what they might have been as far as I know as been lost in antiquity and no doubt no longer exist! ?